The days of 10 cent, double feature Saturday matinees are long gone, but nostalgic Beachers hold fond memories of the film palaces of our youth. 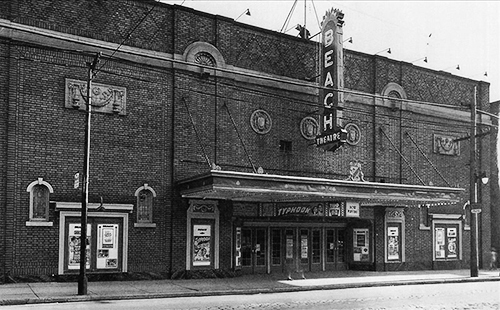 Before television came along in the 1950s, the Beach had as many as seven neighbourhood cinemas at one time. Who remembers the Beach, Family/Lake, Manor, Kingswood, Scarboro or Ideal? Only the sly Fox is still running movies. History and movie buffs will enjoy a new book by Doug Taylor titled Toronto Theatres and the Golden Age of the Silver Screen. Taylor tells the stories of local movie houses from the early days of storefront nickelodeons to the TIFF Bell Lightbox of today. Each chapter in the book traces one era, highlighting the decades when film theatres were the centres of entertainment in a community. The earliest motion picture shows in the Beach were likely held at amusement parks: Munro Park (around 1900) and Scarboro Beach (from 1907). By 1910, buildings were being converted to show flickering images. Look at the Beach Hardware store on Queen near Wineva and imagine attending photoplays there at Kew Beach Pavilion (1910) or Beaches Pictorium (1911). The late, great sportsman Ted Reeve remembered nickel shows at the Coliseum before it closed in 1920. A few blocks west on Queen Street, the Peter Pan Theatre was also around in those early days, replaced in 1919 by my favourite cinema palace of yesteryear, the grand Allen Beach Theatre. A 1929 ad read, “A Nice Place for Nice Folks to Go.” The lavish Beach lasted about 50 years and is now home to the Beach Mall. Director Norman Jewison learned to love movies at the Family (later renamed the Lake) near Queen and Lee. These “nabes” became even more popular after the closing of Scarboro Beach Amusement Park in 1925. The Bonita on Gerrard Street East near Jones (now “The Big Picture”) was converted from two houses around 1910, but that theatre has been closed for long stretches of time over its history. The same could be said of the Revue (1912). The Bloor opened as the Madison in December 1913, but the building was mostly demolished and rebuilt in 1940. By the 1960s the sparkling neon lights on marquees began to disappear as screens faded to black. The sign above the Fox was torn down in 1977. The Scarboro Theatre at 960 Kingston Rd. morphed into Scarboro Billiards around 1967, then Mr. Slate Sports Bar, and is now the front of a big condo complex which retains the Art Deco look of the original theatre façade. The Scarboro offered giveaways like dinnerware, but showed mostly second-run or low-brow ‘B’ pictures. 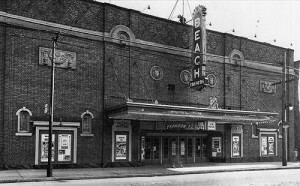 Taylor writes of the time in 1957 when the Adam Beck Home and School Association refused to place ads for the theatre in its bulletin, deeming their films “detrimental to our young people, especially teenagers.” Were 1950s Beach teens in danger of becoming So Young So Bad or a Rebel Without a Cause? Maybe local James Deans tried to wear jeans to Malvern. 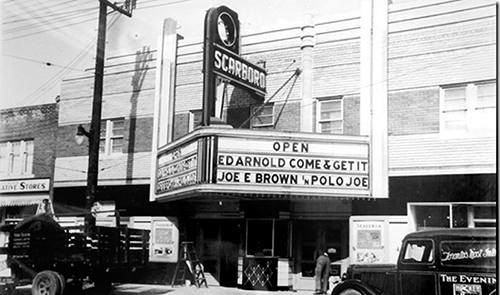 When the Scarboro opened in 1936 there were two candy shops nearby. Did Beach moviegoers love their Jenny Lind and Laura Secord chocolates? In 1939 the Second World War came home to the Beach. Harry Randall ran a tobacco and stationery store near the Scarboro. One night the Randalls woke up to the sound of an explosion. Grimaldi’s Fruit Market next door had been bombed in one of several attacks on Italian-Canadian businesses after Italy joined the war on the German side. During the grim years of the Depression and war, movie houses were popular places for people to forget their troubles and escape from the harsh realities of life into a world of fantasy and romance. May we all have only happy memories of our youthful time spent in darkened cinemas before a flickering screen. If you would like to share your memories, drop me a line through the newspaper office. Remember the Beach in 10 cent days and you got popcorn for 15 cents. Does anyone remember Hubbard Fish and Chips across fgro the Beach?